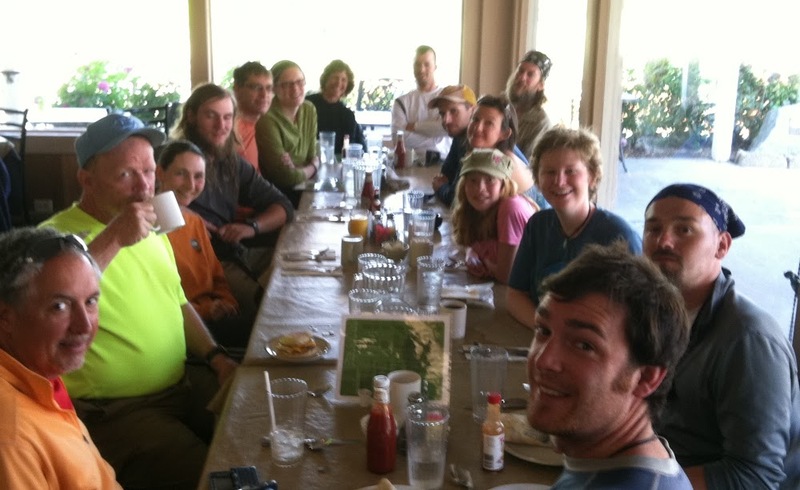 A Warner Springs bfast with: So Far, Speed Bump, me, Patch, Half Fast, Red Blaze, Free Range Amelia, Will, Balls, Dutch, Crumbs, Sunshine, Whitnee, Nick, and Starvin’ Marvin. When I woke up, it felt like all the hikers had gathered at Barrel Spring. The intention was to only be a few miles out of Warner Springs, but the generosity of the trail angels at Barrel Spring changed that plan for everyone. Well worth it! Since we only had a 9.4mi walk into town, the day is called a “nero.” It was a nice morning hike with Will, Balls, and Sunshine. We stopped at Eagle Rock and took pictures and then ran into more trail angels (thanks Tobasco and Hamburger Helper!) who gave us juice and pb&j burritos. We did a bit of a road walk and were checked into the hot springs by 10:30am. Ah! Will and I going through our resupply boxes. I was convinced to stay for two overnights making the next day a “zero” because we did no hiking at all. I’m itching to get back out, but everyone says it’s this recovery time early on that will make me stronger in a few weeks. It’s very relaxing here. I am roomed with Speed Bump and Will. We got our resupply boxes, ate some good food, and soaked in the hot springs. I was happy to get my pics from the first section up for everyone and got some shows watched:) It appears that the next 70mi to Idyllwild will be quick and fun. The heat has lifted and there is a trail angel 17mi away who has cots for hikers and word has it that he’s hosting a BBQ. We are way too spoiled in S. Cali! So great!…off to the hot springs!